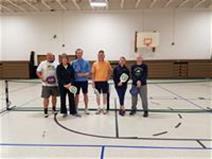 Pickleball is a paddle sport created for all ages and skill levels. The rules are simple and the game is easy for beginners to learn, but can develop into a quick, fast-paced, competitive game for experienced players. In recent years it is has gained quick popularity among seniors, but is a great game for anyone! This clinic will be instructed by USAPA Ambassador W. Scott Walker, and is intended to introduce the game and build interest for more pickleball programming we may offer in the future! The clinic will be held on April 25, 2018 at the TEAC (Old Prospect) gymnasium. The address is 200 Dailey Drive, Orange, VA 22960. The registration fee is just $5, but pre-registration is required. Registration is open to adults 18+.